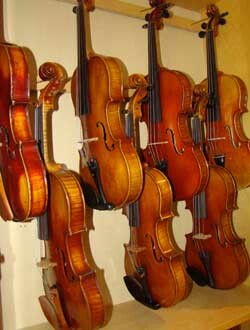 We offer one of the largest selections of both newly manufactured and hand -made vintage violins, violas, cellos, basses, and bows from all over the world. Our success as a dealer can be attributed to our three curators who have, over 100 years combined experience in the aqusition and selling of fine violins. All our instruments are then properly set up and voiced with a collaboration between luthier and player. To ensure your satisfaction we offer a one week trial period before your purchase, and a 100% trade up value thereafter. The heart of our shop, however, is in the repair and restoration of superior instruments. We offer one of the finest and most diverse repair facilities available. Our owner, Luthier Ron Procopio, has 25 years of exceptional service to the professional string instrument community. Our service extends far beyond the usual repair shop or dealer. Where most repair shops and dealers are capable of servicing only specific instruments, and usually at a modest level, The String Tree is capable of performing elite repairs on both orchestral and fretted instruments. We are devoted to making sure that every instrument will be preserved and protected for subsequent generations of musical talent. So whether you are a professional musician, amateur, instrument dealer, or repair shop, The String Tree is your choice to help you with your string instrument needs. The String Tree: No strings. Just string instruments.